GALION — The 2017-2018 boys basketball season for Galion High School begins on Friday, Dec. 1 when the Tigers will play host to the cross-county nemesis Bucyrus. Galion defeated Bucyrus on the road last season, 47-38, to give head coach Matt Valentine his first career coaching victory. Valentine is entering his second season as the leader of the Tigers and is looking to improve on last year’s 3-20 (1-11 in the Mid-Ohio Athletic Conference) finish. The head coach will have six lettermen returning to help the Tigers bounce back, but lost a key element to graduation last spring. Chase Cooke is now at Baldwin-Wallace University playing football. But last season, on the hardwood, Cooke earned an all-conference honorable mention nod. Nic Sorrenson and Mario Freeman, as well as Tristan Baldy, all walked the graduation stage and received their Galion diplomas last spring. With those four seniors gone, Valentine will look to his three incoming seniors for leadership. Big man Colton Skaggs and guards Colton Powell and Nate Eckert are being counted on to lead the Tigers to an improved campaign this winter. Skaggs and Powell both earned varsity letters a year ago. Also back on the floor for the orange and blue will be juniors Gage Lackey, Jack McElligott and Zhamir Anderson and sophomore Isaiah Alsip. Lackey and McElligott bring length and sharp shooting to the perimeter and Anderson will be fighting for the point guard spot. He brings “bursting speed” to the mix, according to Valentine. 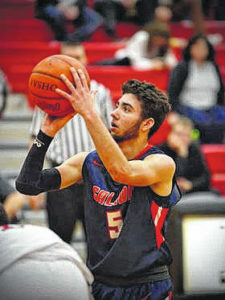 Alsip earned a second-team all-conference nod and was named to the honorable mention all-Northwest District squad as a freshman, when he averaged 12 points per game for the Galion offense. Junior Tristan Williams, who played some varsity last season and was a starter on the junior varsity squad, will look to contribute big finishes around the rim and provide much needed size on the interior of the Tigers’ defense. “We have the work ethic and the experience, but we must work on our decision making, our ball control and our defense if we want to be more competitive in the league and overall,” said Valentine of his preseason expectations. And what does he expect from the MOAC this season following the addition of the Clear Fork Colts and the Ontario Warriors? “Look for Clear Fork and Ontario to come right in and challenge for a league title. You also can’t leave out Harding, Pleasant or North Union…this is a solid basketball league all of the way around,” Valentine said. Harding finished just 13-10 overall in 2016-17, but won the MOAC Red Division title by finishing 10-2 within the conference. Pleasant came in second and North Union finished tied for third with Jonathan Alder. After the opener Dec. 1 against Bucyrus, Galion will play the always difficult Upper Sandusky Rams, on the road, on Thursday, Dec. 7. The next day, the Tigers will kick-off their MOAC campaign with a trip to Marion for a clash with the Pleasant Spartans.